It was 1-day hike in Żywiec Beskids. 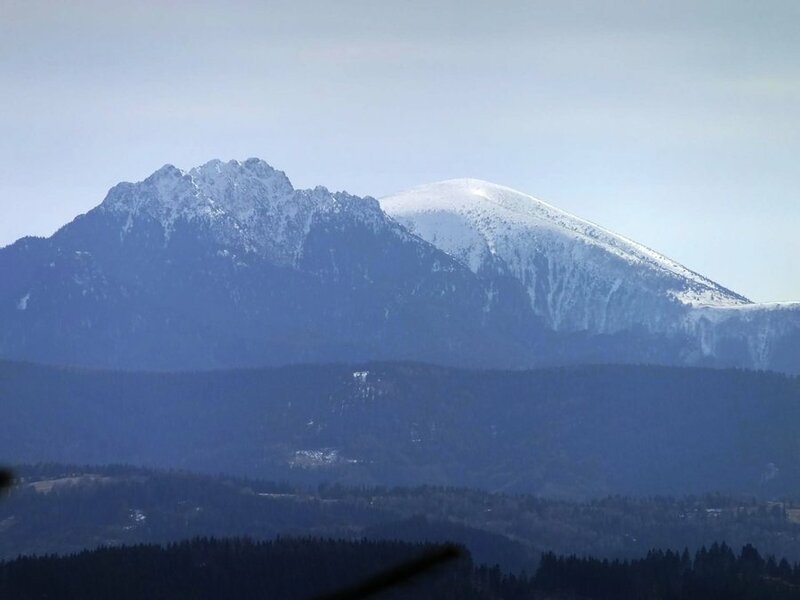 This time it was Rycerzowa Wielka (1226 metres) that we wanted to hike to. It was early spring and the trail was partly covered in snow and ice. We started hiking from Rycerka Górna Kolonia (670 metres). We followed green trail leading to mountain hut on Przełęcz Przegibek (Przegibek’s Pass) on 1000 metres. We had there a short break and set off towards Rycerzowa Wielka following red trail. I thought it would be easy peasy lemon squeezy hike but there had been quite a lot of frozen snow on the trail - welcome adventure! At one point, along with my sister, I got stuck for a while and wasn't sure what should we do. Where should we put our feet not to collapse? And how should we actually make the move if we cannot move? Well, the fact that my sister and I started laughing like crazy didn't help the matter but, at least, lifted our spirits 😉 I didn't have hiking poles at that time and it was difficult for me to make any move but finally, taking minute steps, I got to the safer snowy area outside the trail. When we finally got to the peak we decided that a hot soup in nearby mountain hut (1117 metres) is a must. As usual, we had tomato soup. Surprisingly, tomato soup is always good at every Polish mountain hut . To avoid going the same way we climbed down along blue trail which runs parallel to red one. Then, on Przełęcz Przegibek which changed trail into black one. In the final part of the trip, at Pod Bednoszką Wielką (1066 metres), we chose red trail which leads to Rycerka Górna. It was nice, several-hour long trip and I'd highly recommend hiking to Rycerzowa to everyone, especially to families with children. There are really nice views and the hike's fairly easy (provided the trail isn't covered in ice). And you, have you ever got stuck on the trail?